Reverse Osmosis is the opposite of osmosis. If osmosis is the transfer of solvent molecules from low concentrations to high concentrations. 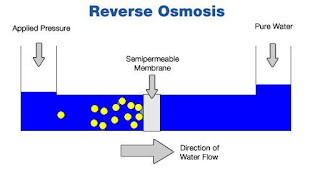 So reverse osmosis is the transfer of solvent molecules from high to low concentration. Reverse osmosis (RO) is a water purification technology that uses a semipermeable membrane to remove ions, molecules and larger particles from drinking water.